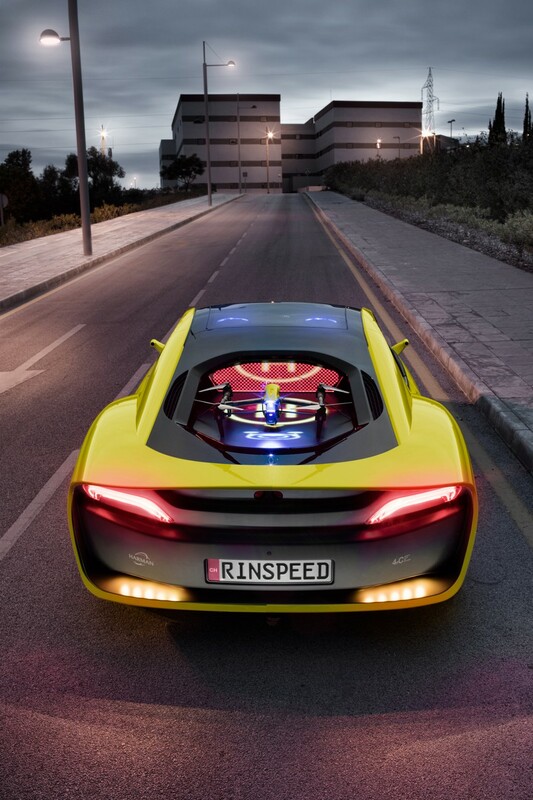 CES Las Vegas 2016: Rinspeed demonstrates future possibilities and raises future questions with the self-driving “Ʃtos” concept car On the road with my personal autopilot and drone - future here I come! It’s show time in the gamblers’ paradise Las Vegas: For the first time ever, Frank M. Rinderknecht, boss of the Swiss idea smithy Rinspeed, celebrates a world premiere outside his Alpine home with the hybrid sports car “Ʃtos.” The automotive visionary says: “The digital world will provide the major and above all the disruptive innovations in automotive engineering. 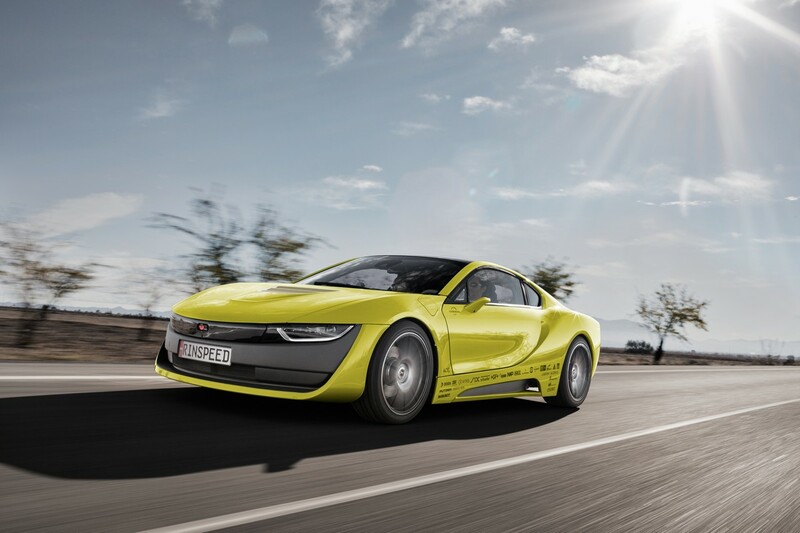 That is why nowadays all major car manufacturers and suppliers are present at the CES Consumer Electronics Show.” As always, the Swiss mastermind approaches the mega topic of “self-driving cars” primarily from the perspective of the driver and the occupants, the human component. And as always, he garnishes his concept with a host of inspiring and emotionally appealing highlights. In so doing, the automotive thinker together with consulting firm EY expressly puts one question on the agenda that is bound to occupy us for quite some time: How much human component should, must or may there be in a machine? Everyone involved realizes that answering this question requires merging expectations, tolerances and acceptance. There are countless unsettled issues, for example the morals and ethics of a machine, that need to be resolved. In addition, the means for the technical realization also must be developed. Rinderknecht ventures a prediction: “This process will likely lead to an adaptive, learning and intuitive control software. 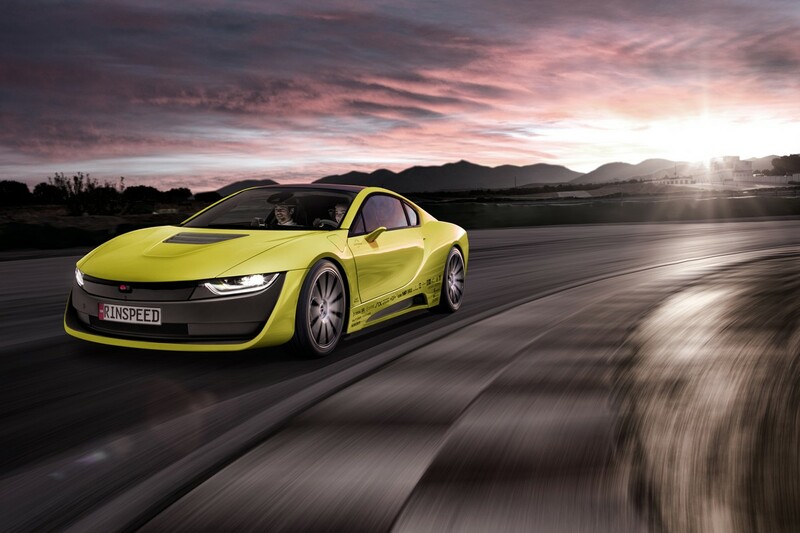 But it will be a long rocky road.” The technical highlight in the interior of the “Ʃtos” is no doubt the folding and retracting steering wheel from ZF TRW. As if by magic, it disappears in the dashboard in a few seconds. This creates lots of space in front the driver who can grab and read a book in comfort the old-fashioned way or can work in a relaxed atmosphere. The position of the two curved 21.5-inch Ultra HD widescreen monitors is individually adjustable to provide an even better view of the displayed contents. 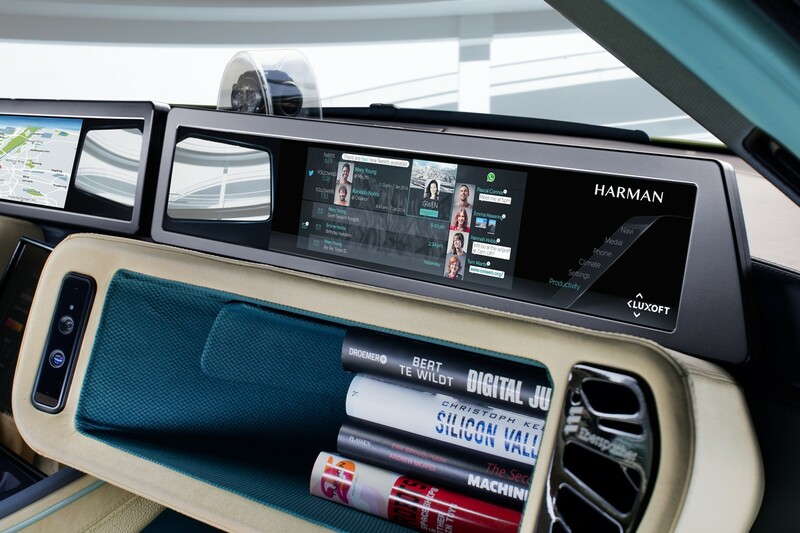 A matching fit is provided by the unrivalled infotainment experience that the innovative Harman Connected Car technologies conjure up in the vehicle. Just like a personal assistant, the system thinks along, is courteous, anticipates needs and on top of that provides perfect entertainment, connectivity and maximum safety. Destinations, route selection, tourist attractions, refueling, parking, making phone calls, music, videos or personal preferences - with every mile the “Ʃtos” gets to know the appointments, wishes and needs of the occupants better and in a flash proactively offers up the particular fitting selection options. This drastically reduces the number of distracting manual entries - despite significantly expanded functions. Should it nonetheless be necessary to enter a command, the “Ʃtos” responds promptly to voice commands, gestures, touch input, controller or the push of a button. where and how long they can expect to make phone or video calls without interruption, the technology also allows smooth media streaming as well as efficient and targeted vehicle updates. The seamless link to the traffic infrastructure such as traffic lights or traffic management systems and to other cars, especially emergency response vehicles, lets drivers and the vehicle look far beyond their own horizon and even through obstacles. 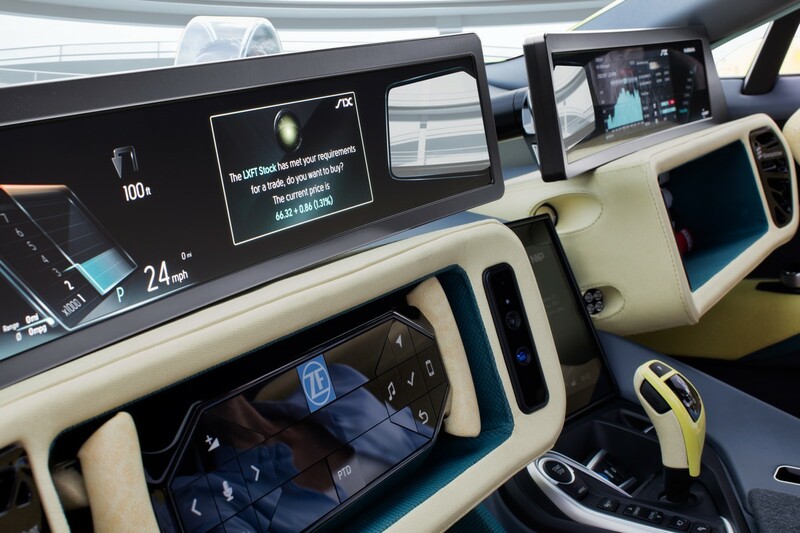 The so-called ‘E-Horizon’ provides innovative safety and convenience features such as precise warnings of wrong-way drivers or simply gliding along smoothly in sync with the phased traffic lights. Speaking of seeing: The gaze-tracking system of the “Ʃtos” permanently monitors the driver’s eye movements and as a result, the vehicle not only knows what the driver has seen, but also what he has failed to see. This allows custom tailoring the displayed warnings and notifications. For precisely this reason, the electronic exterior mirrors only display an image when the driver consciously checks them. The HMI was designed and programmed by Luxoft. Georg Fischer Automotive supplied the aluminum lightweight-construction frame for the three displays. 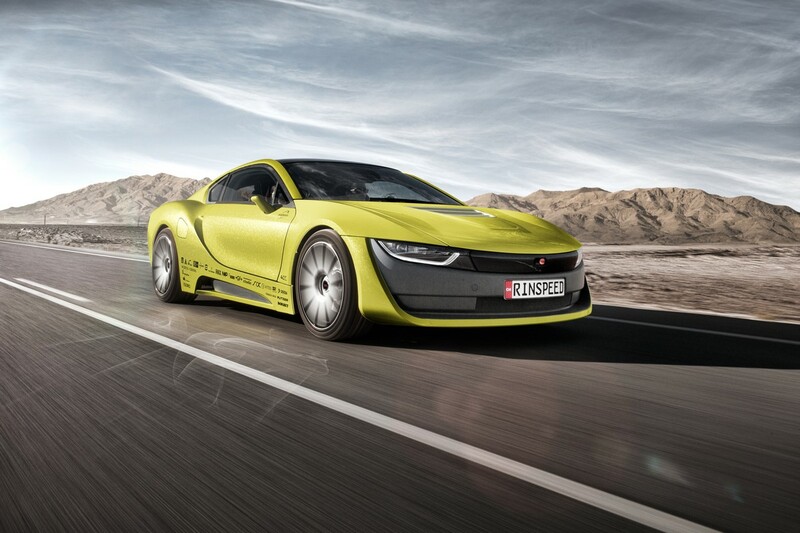 As always, the Helvetian think tank, which following an old tradition once again commissioned the Swiss colleagues of 4erC to design the twenty-second concept car and Esoro to handle the technical realization, explores the existing digital possibilities - and demonstrates new ones. The “Ʃtos” is fitted with an on-board DJI drone complete with landing platform in the rear. An armada of 12,000 individually controlled LEDs can transform this platform into an electronic message board or a visual dancefloor. This technical marvel was designed by Swiss specialist Weidplas, which is also behind the rear window that has been converted into a third brake light and the brilliant seat inlays. The drone itself is capable of providing some very useful services. For example, it can quickly pick up a bouquet of flowers for the significant other ordered on the way home. And the little flyer is a lot of fun when it acts like a UFO, shooting a selfie of the ride in the “Ʃtos” on your local favorite route and streaming it live to friends. Heads up: that little thing has an extremely high addiction and envy factor! 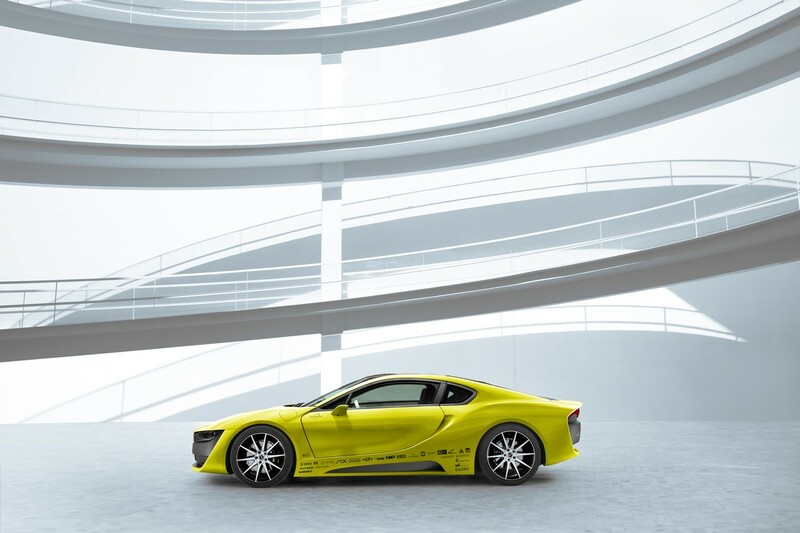 The elegantly and futuristically styled “Ʃtos” - on the technical basis of the BMW i8 - is a sustainable but also a fast racer. The deep black and shiny 20-inch Borbet GTX aluminum rims leave no doubt about that. 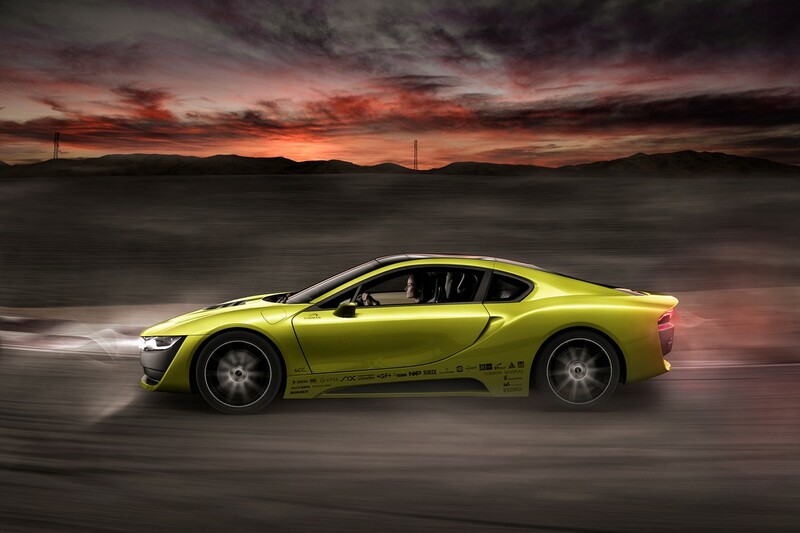 They give the body an imposing visual width and provide perfect handling on the track. To make the athlete as light as possible, Corning manufactures the glass roof and the “drone pad” in the rear from especially strong, lightweight and thin Gorilla glass, the same kind used in smartphones. 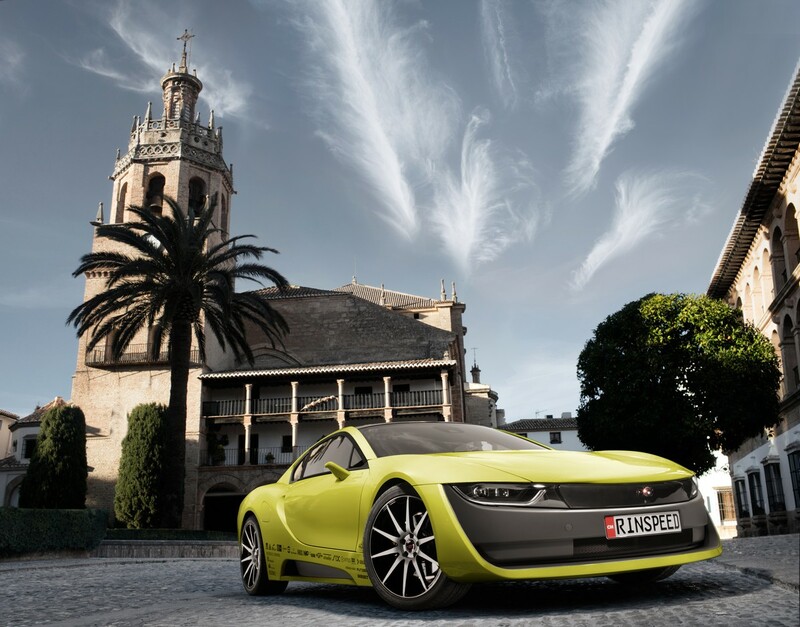 The aluminum front structure and the carbon fiber passenger cell are joined together with ultra-high-modulus adhesive from Sika. No question, Rinderknecht not only plays the role of the visionary, but also that of the magician in Las Vegas. And since a great show also goes hand in hand with unusual eye-catching packaging, the Swiss national uses ceramics and metal alloys in the “Ʃtos.” They are applied at temperatures above 20,000 degrees Celsius and at supersonic speed. 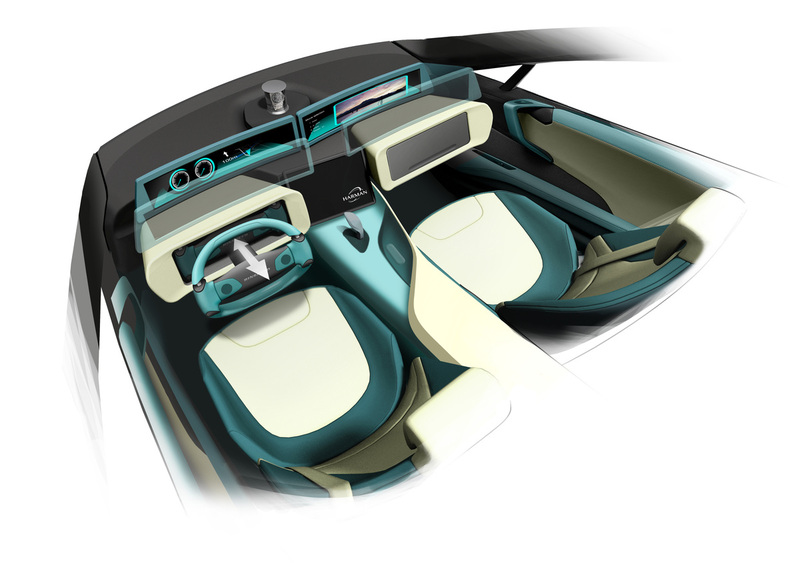 The result is a unique appearance, a new touch and feel and a novel functionality that are all unprecedented in automotive construction. Apart from delicately designed trim strips, the vehicle sports rims with a titanium protective edge and non-slip titanium pedals. These magic moments come courtesy of the specialists from the German company Putzier Oberflächentechnik. Touch it, feel it - it really is magic! The inviting interior, designed jointly by innovative textiles supplier Strähle+Hess and Stahl Company, the surface specialist for leather and synthetic substrates, forms an unusual and striking compound of natural leather with a variety of characteristics, patterns, functions and surfaces with the equally versatile textiles and piping. This creates a sporty and yet relaxed feel-good atmosphere, adorned with the embroidered skyline of San Francisco. As in past years, Schoeller Spinning Group supplied the high-tech threads for the interior. The 3D effect finish of the paintwork on the front panel from Barlog plastics creates an exciting and striking visual bridge between the headlamps. Polymer specialist Rehau developed the innovative lightweight-construction dashboard support and the clever bracket for the luggage shelf with detachable umbrella holder. A particularly efficient electrical heating system from Eberspächer provides cozy warmth in the interior. It also preheats the battery and offers a convenient auxiliary heating function. In keeping with the times, operation is by smartwatch or smartphone. The batteries of the “Ʃtos” are equally state of the art. Thanks to sophisticated technology from EVA Fahrzeugtechnik, they can also have a secondary purpose as a stationary energy storage unit when needed and consequently account for the requirements of the environment. Connected cars are de rigueur nowadays. 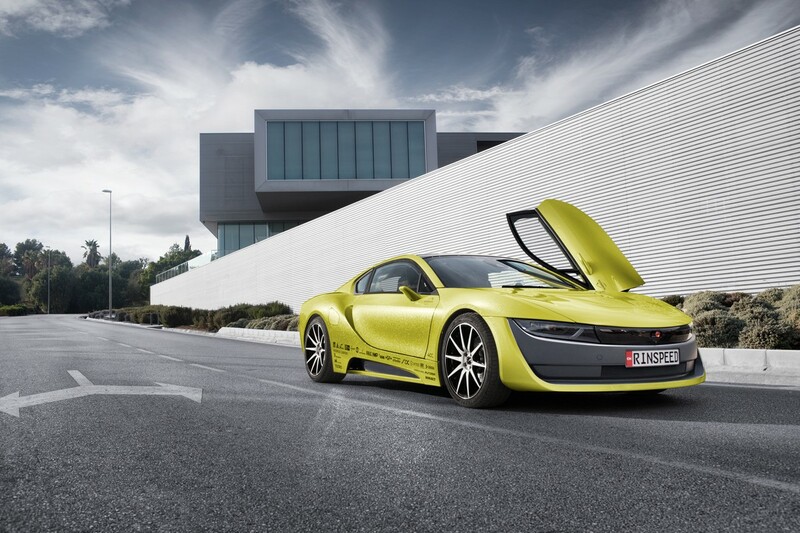 In the “Ʃtos,” Rinspeed partners demonstrate what is possible in the area of connectivity today and tomorrow: When it comes to data, perfect transmission and reception quality is essential not only for autonomous driving. The highly advanced octagonal flat antennas from Vites integrated into the glass roof play a crucial role to this end. Inrix Company shows how a parking space in the city center can be located quickly by analyzing real-time data. The intelligent “Mica” industrial minicomputer from industrial connectivity specialist Harting illustrates how powertrain and engine data can be recorded continuously and transferred to an independent and neutral body such as Dekra, where they can be analyzed and presented depending on the contract previously negotiated between customer and contractual partner. This also makes it possible to lend credibility to odometer readings. 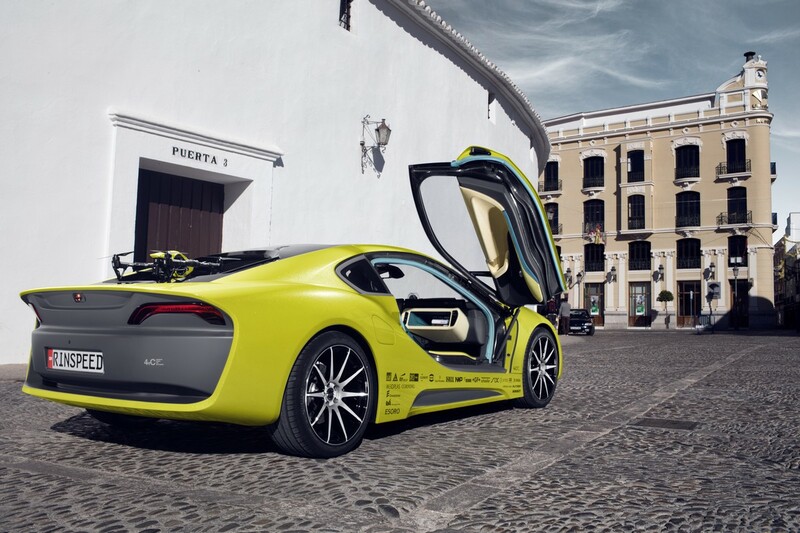 NXP ensures the secure connection of the car and its passengers to the outside world with its intelligent connectivity technologies – an important aspect for the connected self-driving car of tomorrow that must reliably capture its surroundings. This includes radar and car-to-x solutions as well as automatic payment for parking via NFC, wireless cell phone charging, smart access solutions and keyless remotes for unlocking, starting and customizing the vehicle. SIX, the Swiss stock exchange and backbone of the Swiss financial market, shows an “on the go” payment system for secure transactions in the “Ʃtos.” Even smaller amounts such as tips can be paid by a small swiping gesture on the exterior mirror. The tireless Swiss national and his international partners show a first step towards tomorrow’s individual mobility with the “Ʃtos,” staged by Saarbrücken-based Vollmond advertising agency. 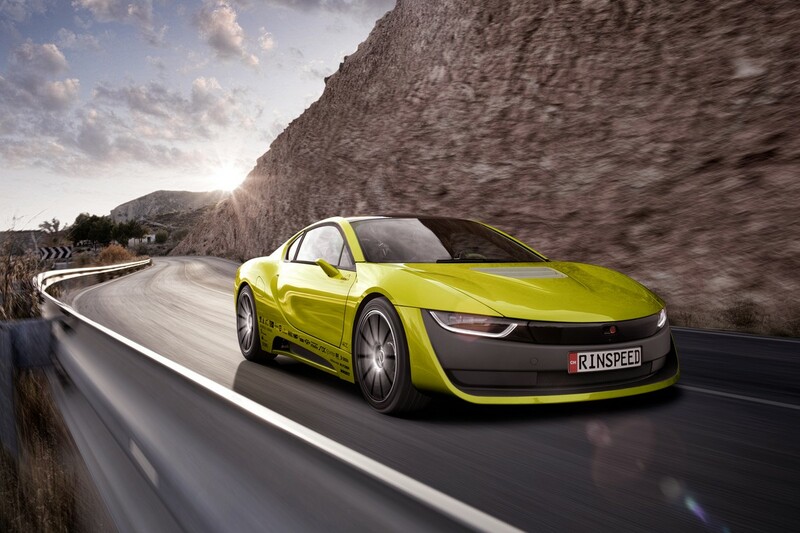 The Rinspeed “Ʃtos” celebrates its world premiere at the CES, January 5 to 8, 2016, as part of the exclusive HARMAN event in the Muse Hall of the Hard Rock Hotel in Las Vegas. 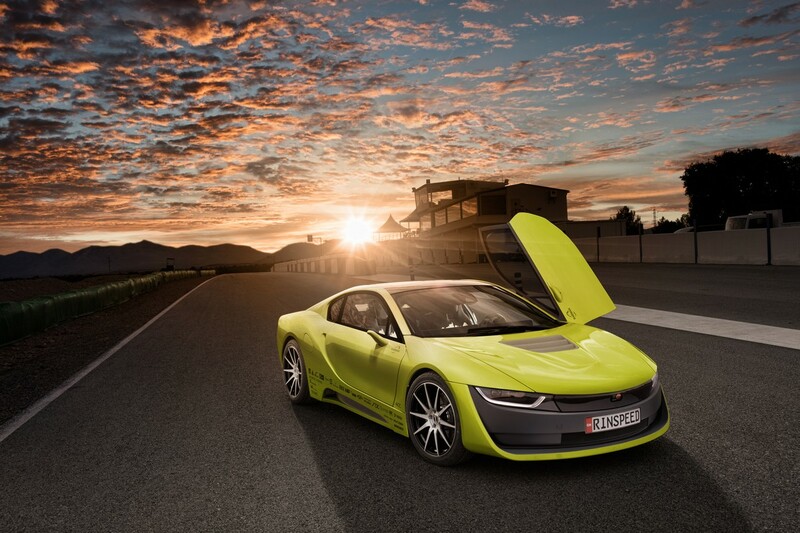 Its European premiere will be at the Geneva Motor Show starting March 1. You’ll never drive alone! Personal autopilot and drone on board. The Swiss progressive thinker approached the mega topic of “driverless cars” largely from the point of view of drivers and passengers, and has generated a number of equally inspiring and emotional ideas. 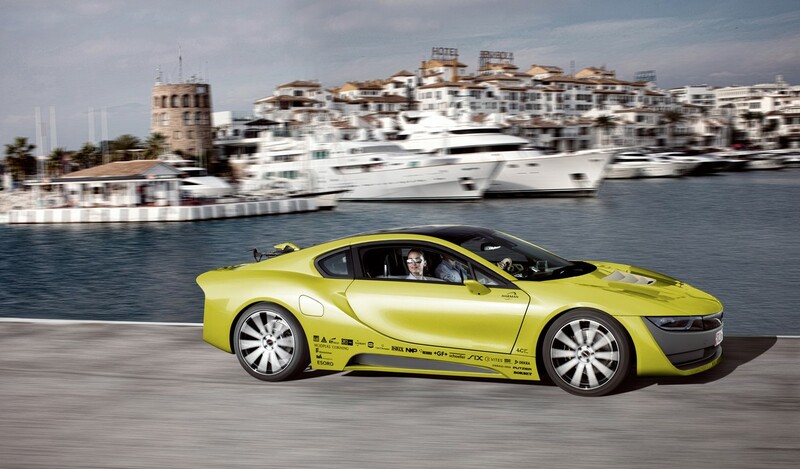 They include an intuitive, adaptive autopilot capable of learning. The resulting and much-debated question “How much man should, must or may be in a machine?” will be discussed for a long time. 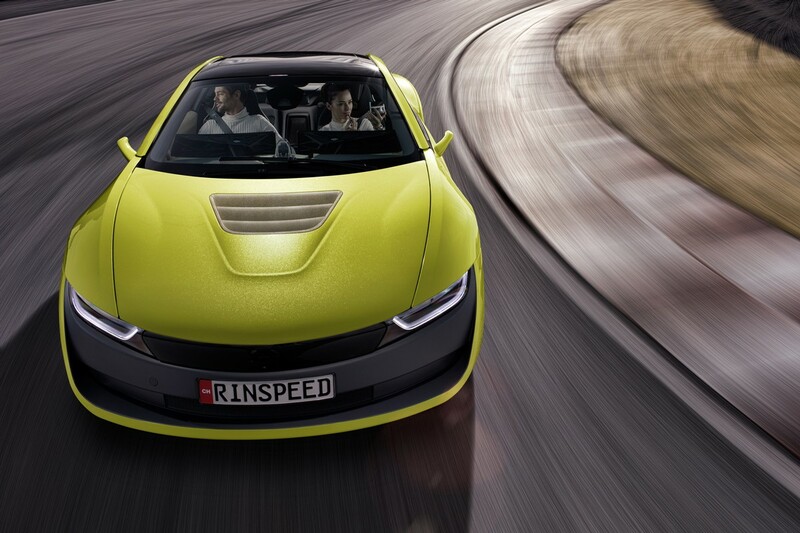 To provide the passengers with a unique infotainment experience, the Rinspeed „Ʃtos“ uses the innovative Harman Connected Car technologies. Just like a personal assistant, the system operates in a thinking, courteous and anticipatory manner. In addition, it delivers perfect entertainment, connectivity and maximum safety. As is its tradition, the Helvetian think tank studies existing digital possibilities - and demonstrates new ones. 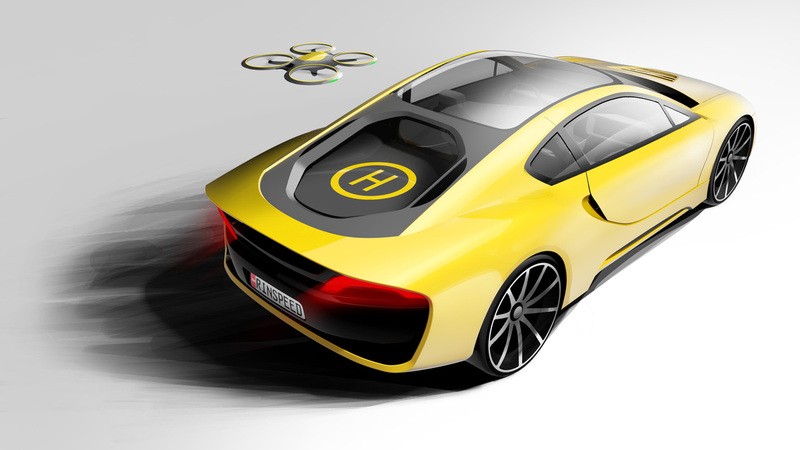 It has fitted its sporty hybrid with a drone that has its own landing pad on the rear end. The many benefits this offers are evident: For example, it could fetch a bouquet of flowers the driver ordered online and even deliver it directly to the lucky recipient. It could also take a video of the wild ride on the favorite fun road and stream it live to friends! No doubt, Frank M. Rinderknecht presents himself as a visionary and magician in Las Vegas. 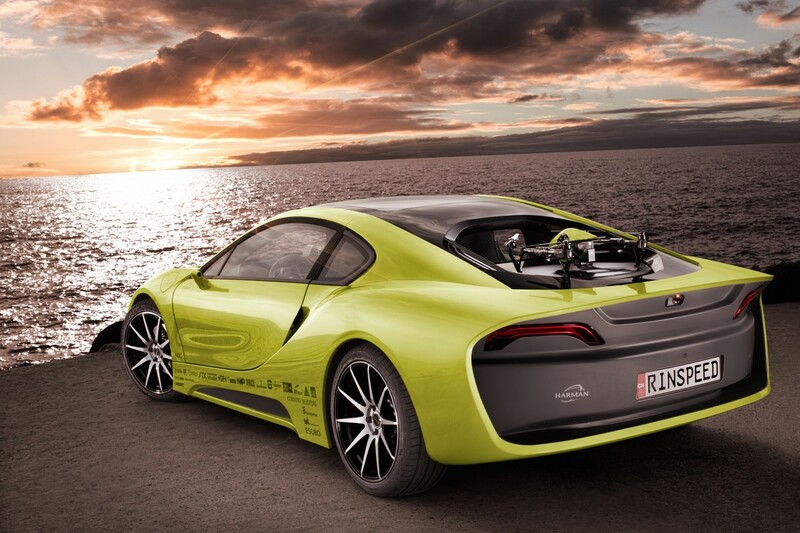 And, because a great show also definitely requires extraordinary head-turning packaging, the Swiss national opted to use special innovative surface finishes in the „Ʃtos“ that are still completely alien to car designers. Touch it, feel it - it’s magic!